Menus are listed from most to least inclusive. When you have a truly special event, you want the best. The Maho Bay Package is a comprehensive package that includes everything from the previous levels, plus a full-service 3 hour open Call Bar, leaving you free to attend the party instead of attend to the details. We will handle the beverages, mixers, fruit, ice, coolers, cups, and even include the bartender! Upgrades to Top Shelf and extended hours are available, just ask. 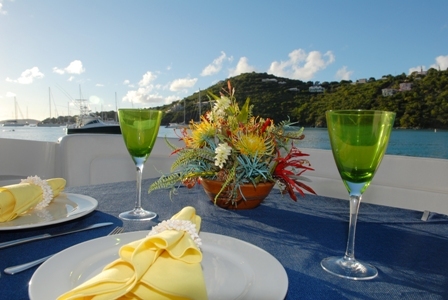 The Cinnamon Bay package adds formality to the affair–You’ll have the same menu options as in Trunk Bay Package, but with the flair and class of real china, silverware, linens, and glassware. We also include all of your furniture rental needs such as tables and chairs with the Cinnamon Bay Package as well as an extra staff to act as your dishwasher. If keeping it casual yet elegant is your style, consider the Trunk Bay Package, which includes the food and staff on site. Our professionals at St. John Catering will bring everything you need to pull off a successful event, execute it, and clean it up. Having chefs on site allows us to expand the menu possibilities at this level. For those who are on a budget but still want top-notch cuisine, our delivery option offers the best of both worlds. You and your guests get to enjoy the convenience and flexibility of having a catered event on your own schedule without the cost of staffing. Our team will ensure the freshest available product, expertly prepared and delivered to your doorstep. 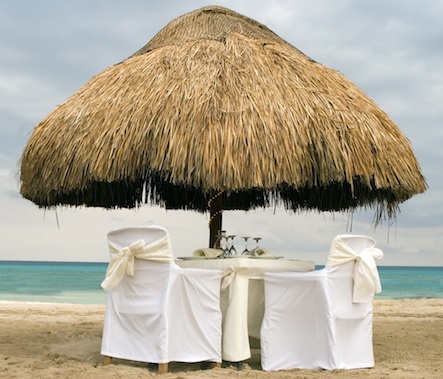 Treat your guests to the most “Island Style” of events by hosting your party right on the beach. Let us take care of all the permit details and all you have to do is show up and dig your toes in the sand. We provide the delivery of all items including disposable dinnerware. This package can also come staffed for additional fees. All of our wedding packages have an appetizer menu built in, however if you are thinking of having a cocktail reception for a welcome party or any event with your group, check out our options for a classic way to start off your event. This package can also come staffed for additional fees. There really is nowhere more beautiful than the Virgin Islands to host your perfect destination wedding- and with a name like “Love City”, St. John has to be right. The stunning beaches, endless sun and crystal clear waters of the Caribbean are the perfect backdrop for any celebration. With everything you need to host the destination wedding of your dreams, St. John Catering / Mathayom Private Chefs invites you to explore our options to find what fits you best. We have something for everyone and promise to make your Caribbean destination wedding everything you’ve dreamed of. Please note, there will be a 15% service charge on parties of 20 people or more, with additional gratuities welcome at your discretion.